Prominent Val Verde leader Miriam Monroe Canty died Thursday evening en route to Henry Mayo Memorial Hospital in full cardiac arrest, with her husband by her side and holding the hand of her favorite niece. Canty, 84, is survived by Elijah, her husband of 60 years, her niece Vivian Hicks, nephews Charles and Cleveland Cullens, first cousin Gracie Monroe, seven grand nieces and nephews and eight great-grand nieces and nephews  including two sets of twins and another baby on the way. Her older sister Vivian Monroe Cullens preceded her in death several years ago and Miriam became a surrogate mother to "little" Vivian, as her family knows her. "She was my rock," Vivian said. "If I missed a day calling her, being a concerned and loving person, she would call me to make sure that all was fine. All of us will miss her so much." 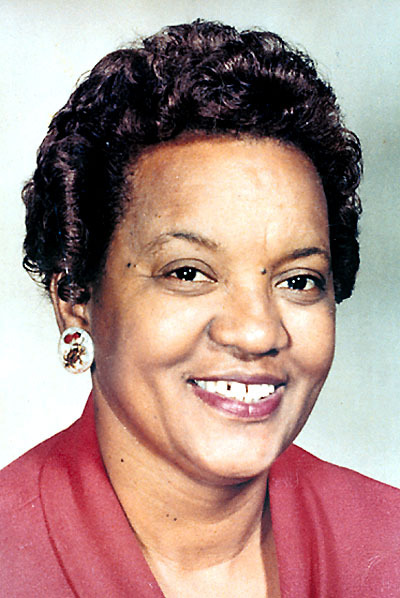 Born May 6, 1916, Miriam Canty was a school teacher for 30 years and was recognized in 1996 for a lifetime of achievement. She was a driving force behind the establishment of the Samuel Dixon Family Health Center and served for many years on its board of directors. She was the keynote speaker at the opening of the clinic's second facility in Canyon Country in November. Fellow Samuel Dixon board member Greg Bradley made note of her dynamic personality and said "she will be greatly missed by all of us." Recognized throughout Los Angeles, the Santa Clarita Valley and Val Verde, Miriam was the recipient of many awards, including a Dedicated Services Award for her devotion to after-school tutoring and literacy from the Los Angeles County Department Parks and Recreation, and the SCV Boys and Girls Club. She also received several Zonta Club awards for her work with their Healthy Kids program and was celebrated as a "Status of Women" honoree. She received a special award from the Val Verde Civic Association for her work with the youth of the community. "Miriam Canty was a wonderful, dedicated Val Verde pioneer and lifetime achievement honoree," said Santa Clarita Councilwoman Jo Anne Darcy, former senior field deputy to Supervisor Michael D. Antonovich. "She was a patient teacher, a committed activist and an outstanding volunteer and leader in Los Angeles, the Santa Clarita Valley and Val Verde." Canty and her husband Elijah came to Val Verde in 1948, when it was still a rural, African American enclave during a time when blacks suffered discrimination in larger, pre-Civil Rights era metropolitan cities such as Los Angeles. The couple had been activists in their youth, participating in sit-ins at restaurants in Savannah, Ga., in 1944 and 1945. Val Verde had no lights or water lines when they purchased land there in the 1950s. They focused their activism on their new community and are credited for many of the area's improvements over the years. Miriam helped form the first senior group in Val Verde and devoted much of her time to the Santa Clarita Valley Senior Center. She was involved in the Girl Scouts, served on the board of the SCV Boys and Girls Club, and was responsible for bringing the county Bookmobile to Val Verde. Dan Nordenstrom, treasurer of the Val Verde Community Benefits Funding Committee and a newly appointed Samuel Dixon board member, called her "a dynamic woman. When she felt her neighbors orcommunity needed her, she would selflessly devote her time to achieve her goals. Losing this lady is a great loss to our community and I hope Val Verde takes notice of her passing and assists our remaining seniors to bring the generations together and pass their wisdom on to our children." A viewing will be held Thursday at Forest Lawn Cemetery, 6300 Forest Lawn Dr., Hollywood Hills, from 4 to 9 p.m. in the second-floor chapel, followed by services on Friday at 11 a.m. at the Congregational Church of Christian Fellowship, 2085 S. Hobart Street, Los Angeles. Afterward, a procession will drive to Forest Lawn Cemetery for a graveside ceremony and interment. Friends are welcome at both the viewing and the service. Flowers should be sent to Forest Lawn by Thursday afternoon. As one community member said upon Canty's passing, "The Lord has taken one of our best to his house, and he will care for her as she cared for everyone she knew." Story originally appeared in The Castaic Signal. Used by permission.